Most homeowners policies include several types of “special” or “additional” coverages, which provide over-and-above coverage for our home and personal property. These special circumstances and additional coverages will provide compensation for items such as debris removal, landscaping, animal and insect damage, antique coverage and updates for city code compliance. Debris removal typically qualifies as additional coverage when tree limbs and damaged building materials need to be removed, or when pollution cleanup and/or decontamination is necessary. For example, if a tree falls on our house and leads to scattered pieces of wood and roofing, we want to ensure that our roof is repaired and that our house is cleared of any remaining debris. Our homeowner’s policy probably provides additional coverage for those costs. If our yard, shrubbery or garden is damaged, we are usually entitled to additional coverage for landscaping under our homeowner’s policy. The amount of coverage available for landscaping will depend on the particular policy. Certainly, if a hurricane hits and damages or destroys our home and yard, restoring destroyed shrubs is likely to be the last of our priorities. Even so, we have a right receive all of the coverage we paid for. An accident or disaster, such as a fire or hurricane, can also damage the inside of our home and may destroy or break antiques or pieces of art. Under most homeowner’s policies, there is additional coverage for these personal losses (over and above additional coverage that may be provided through adding a special rider). Like a hurricane or fire, animals and insects can cause major damage to our home or property. 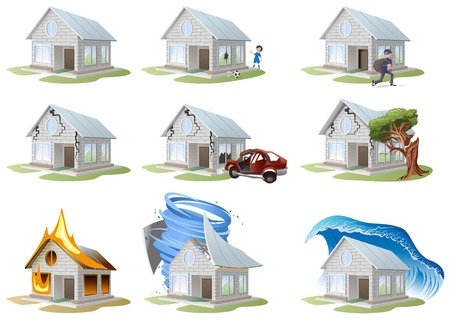 Many homeowner’s insurance policies provide additional coverage for these special circumstances. For example, if part or all of our home has become unlivable due to damage caused by termites, our insurance company may cover our claim (in the absence of a separate exclusion). Rodent infestations are handled in a similar manner. A rat chewing through electrical wiring, for example, is not necessarily a type of damage you can monitor and in many cases will be covered. When it comes to larger animals, insurance companies are more likely to cover damages from a one-time occurrence. Whether the exterior of our home is destroyed from termites or a falling tree from a hurricane, if the damage is covered our insurance company will usually also provide additional coverage for the cost of re-building that part of the property so it is up-to-code. This type of coverage protects us when it more expensive to repair damage than originally estimated because changes in city or county Codes require different or more expensive materials or building specs, such as improved wiring, sprinkler systems or increased elevation. Although coverage for these special damages is very beneficial for a homeowner, many do not know about or take advantage of these additional coverages. Sometimes insurance companies hide these coverages in small print, or fail to discuss these opportunities with us after a loss. If you or a loved one feel you have not been provided all the coverage you paid for, or even want to make sure that you seek and obtain all the coverage you paid for in the event of a loss at your home, contact Van Cleave Law. Our legal team has the experience and expertise to find all available coverages and stand up to insurance companies to make them pay.